Well another year is over and it seems they are getting shorter as I am getting older! Yes it's my Big Four-Oh between Chrimbo and the New Year.. Gulp! I'm celebrating the milestone by holding a birthday bash with family and friends, including a sprinkling of celeb pals. No doubt one or two drunken snapshots will make the press..! Its been a very lopsided year, media-wise. I filmed a number of TV programmes throughout 2018 but none were broadcast until November. Then they kept appearing one after the other over the course of the month. There were even two programmes on different channels on the same day. I've a number of shows already in the pipeline for 2019, one of which is a popular evening programme that's going to be way outside my comfort zone. It came as a real shock when I recently got the call to do it. Commercially 2018 has been a busy year for me with a number of new projects ongoing, though I can't divulge anything yet. One in particular will surprise you. It's something I wouldn't dreamt of tackling a few years ago but now I'm super excited about it. I had hoped to be able to tell all before the year end, but it seems I have to be patient and wait on the lawyers to give the go-ahead. In closing I just want to thank you all from the bottom of my heart for your love and continued support. May your 2019 be happy, healthy, and full of love and laughter. Where's this past year gone?! I began 2017 with plans for several new projects but ongoing business has just eaten into my time. Much as I love it when people now refer to me as a 'Businesswoman', the price is the loss of leisure time. Somehow though, I did manage to fit in two trips to stay with friends in Los Angeles. I find it's a great place to unwind and recharge my batteries. Speaking of success, my workout app has had a great first full year. However I just can't get my head around the huge number of downloads in places like China. Surely the majority of users there can't understand a word of what I'm saying?! Unfortunately as business has expanded its affected my availability for the media work I love and also the events I can find time to attend. On the TV front I did complete two programmes which were shown earlier this year but also had to turn down another two as it was impossible to commit to the weeks of filming they required. However I was determined to find the time when asked to record one particular special show this autumn - it was definitely a lot of fun to film, as I think you'll see when it airs next year! Thank you for sharing my journey this year. Special mention as always to the guys who run this site and forum for me - love you all to the moon and back. Hope you all have a truly wonderful holiday season and that 2018 brings everything you hope for. My oh my, where have the past twelve months gone?! Time REALLY HAS flown by this year! Apologies for not popping up at as many events as usual over the past 12 months. Things have been so busy on the business front that I've not been able to make it to as many as I'd have liked. In fact I gather that I've pulled out of more events this year than I've actually attended! Hmm...New Year's resolution...more forward planning needed by moi! Speaking of next year, there are a number of things in the pipeline that I'm really hyped up about, with the first bit of news coming early in January. Can't say anymore at this time, except to hint that one of the things is something people are always asking me about...well I plan to deliver on that during 2017! Looks like the next 12 months are going to see me on the box more too, in fact I'm filming for a new Channel 5 programme on 4th January...starting off the New Year as I mean to continue! Had a blast two months ago filming out and about for a Channel 4 programme which I believe is due to air in February or March, watch out for that, it should be really funny! Thanks for all your continued support as I continue on my journey. Another year nearly over, and what a year it's been! Looking back on the year, two highlights stand out for me. The first was getting Coco as a sister to Charlie in March. I can't imagine life without them both now. The other high point of course was going back into the Big Brother House in June. I'd always wanted the opportunity to go back into 'My House', in the nine years since BB7 I'd never even been into the camera runs. So that's now ticked-off my 'to do' list. Then a few days after finishing BB I spent a week filming 'Britain's Flashiest Families' which was great fun. Only just over half the places we filmed were shown in the October programme and I'm due to film some additional scenes for the next programme airing in 2016. Thailand is wonderful and the three weeke I spent there in November were great - apart from the damage to my foot. It happened coming down a slide - someone had left a sandbag in my path at the bottom! I don't think the Thai's have heard of Health & Safety! My 'gammy' foot has also meant a quiet December, I don't think standing on a red carpet in 'flats' and on crutches is a good look! I'm back at the hospital over the Christmas weekend for treatment and hopefully it won't be much longer before I'm fully back on both feet. And 2016....? Well, the latter part of January looks like it could be very interesting....watch this space!! Wow, it's Chrimbo again and 2014 is nearly over! Where's the past year gone?! Sorry it's a short note this year but it's been so hectic lately, in fact I've only bought one present so far. Yesterday I wrapped up the year with an all day photoshoot in Cardiff and finally got back home exhausted last night thinking I'd have plenty time to get the other presents today. THEN I learnt that the family are expecting to come to mine again this year for Christmas Day! So now I've only a few hours to buy the presents PLUS get everything I need to cook Christmas Dinner for everyone! Actually, I don't mind really, I LOVE IT! And what about 2015? Well, I've a number of things already planned... Look out for me on ITV in January (it's filmed but can't say more than that yet, sorry) and there's a couple of things which will mean me spending more time outdoors next year...(wink!). For all the latest, keep checking into the forum and rest of the site here - they get the info first. Special mention and thanks to emptybox, ofni and secrethousemate for all their hard work keeping the site running this past year. "My fave yearly event", tweeted Aisleyne after she attended the 8th National Reality TV Awards at the Porchester Hall on Tuesday September 25th 2018. 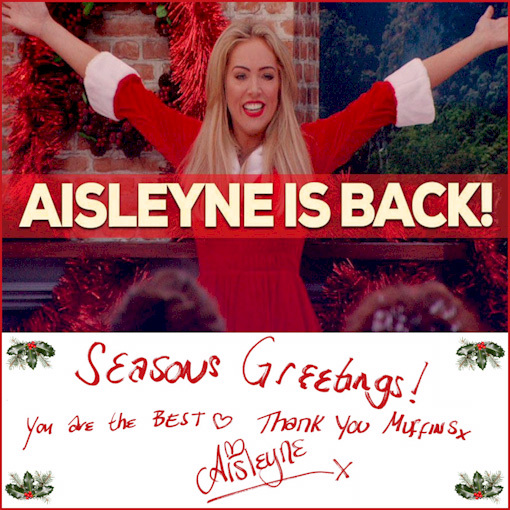 Some people only know Aisleyne in the context of Big Brother; however her real life story surpasses any reality-show plotline.